Sophomore distance swimmer Charlie Stewart-Bates hopes his taper period will help him clinch a spot at nationals. With no more 6 a.m. practices and a cutback on weight lifting, Stewart-Bates has been able to rest his muscles for his three upcoming races at the North Coast Athletic Conference (NCAC) swim championships. Through a process called tapering, swimmers decrease the amount of swimming they do during practice. Men’s Head Coach Adam Cohen says that at its core, taper is rest. Swimmers are able to swim fast because their muscles are not beaten down and tired. The idea of tapering allows the swimmers’ bodies to recover and heal but still be at peak athletic performance at the time of the big meet. Cohen and women’s Head Coach Shea Davisson describe taper as being a magical period of recovery. “What taper becomes is this rest period; this magical, beautiful, best time of year of about two to three weeks depending on the athlete where we rest the body, let the body recover to super-compensate for all the break down so it’s a lot stronger and be able to go faster,” Cohen said. Swimmers spend the entire season training by being in the pool and also lifting weights. Cohen said the team can sometimes be in the pool for three to four hours a day during peak practice season. In general, distance swimmers will taper for shorter periods than sprint swimmers. Davisson said distance swimmers need to maintain the endurance they have built up throughout the season. On the other hand, sprint swimmers need a longer rest period because they tend to be more muscular. 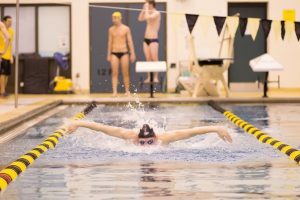 “They hold onto their muscle pretty well and usually those swimmers need more of a taper,” Davisson said. Sprint races tend to be shorter at 50 and 100 yards which means the swimmers are in the pool for shorter times. This brings its own pressures for the swimmers to do well. “Some guys cases that might be 20 seconds. You’ve trained all year for a 20 second thing and that brings its own pressures, but it’s also a lot of fun,” Cohen said. Swimmers also change their daily routines outside of practice to reap the benefits of the extended rest period. From diet changes to increasing hours of sleep, swimmers focus on maximizing their rest period. “You know, take the elevator if you want to rather than taking the stairs,” Davisson said. Senior sprint swimmer Sam Wagner said his focus as the meet approaches is to cut out junk food from his diet, a goal Riemensperger and Stewart-Bates also look to meet. Riemensperger said the extra energy and knowing that she will feel better makes her feel fast. “You want to feel good because if you feel slow, you’re not going to do as well because swimming is 80 percent mental and 20 percent physical,” Riemensperger said. The Tigers hope the added energy will bring out their best times against powerhouses such as Denison University and Kenyon College, programs that have finished at the top time and time again. DePauw will compete in the NCAC championships hosted by Denison today through Saturday.